When we got off the tram in Sultanahmet, Istanbul we knew we were going to like it! We had moved from Amman, Jordan, one of the armpits of the universe, to a beautiful albeit touristy European city in the matter of a few hours. Our friends, Carmen & Geoff had recommended a cute and well located hostel and we were quick to ditch our bags and explore the city. We spent three and a half days in Istanbul exploring the sights. The Turkish government has decided that basically every attraction in Turkey costs 10 YTL (about 8 CADs) for entry regardless of its size, importance, etc. The other strange thing that they do is charge you to enter an attraction within and attraction… (like the Topkapi Palace when they charge you a second 10 YTL to get into the Harem, needless to say this scam made the Topkapi Palace and the Harem my least favourite parts of Istanbul). Hagia Sofia and the Blue Mosque, on the other hand, were grand and beautiful. However, the highlight of Istanbul attractions was the Cistern. As we had come to expect, entry was 10 YTL but it was a very novel attraction and, though moderately overpriced, well worth seeing. The slow music and dripping water was aptly described by Carmen and Geoff as Disneyworld-esque. The rest of our time in Istanbul was taken up with the Grand Bazaar (a much tamer experience than I remember from my brief visit in Grade 9 before I had ever been to Asia when mom thought I was going to get kidnapped), the Spice Bazaar, trendy Istiklal Street and the side streets off of it, and an amazing day ferry ride up the Bosphorus to the Black Sea. The highlight of the Black Sea adventure was certainly when the ice cream guys asked to “taste” (try) Jon’s sunglasses and then calling me and our new friend Heather behind the counter to pose for photo ops! We took an overnight bus ride from Istanbul to Göreme and it was a great introduction to the amazing long distance Turkish bus system. These busses include a bus attendant who brings you water, tea, and a cake before bed – they also have an incredible order that is lacking in the bus system of every other country I have been too. On a later bus ride we needed to change to a different part of the terminal for a connection there was actually a man waiting when we got off the first bus to help us find our way! Göreme in Kapadokya is an amazing place. The small town vibe was totally welcome after the hubbub of Istanbul and the scenery is out of this world. It literally looks like you stepped from your bus onto the moon. So far, Turkey has been amazing. We have just arrived in the backpackers mecca of Olimpos. We came directly from Kas where we spent two very fun days with Carmen & Geoff. Those two days deserve a post on their own so expect to hear more from us shortly, I’ve been too busy catching up on my reading! Wow guys, that sounds amazing!! PS – There are Cheetahs in Turkey?! there was a big article in the usa today about istanbul, which my dad immediately gave to me. i think i’ve already said it, but i love your photos, especially as mine didn’t do so well with the lighting. PS. You are usually allowed to actually go IN the libraries…. I’ve been really intrigued by Turkey for some time. We are going in Oct. You said that you hiked indepently in Goreme (without guide). How do I find out about trail maps or directions for doing this (Rose Valley or Love Valley). I don’t want to pay a guide for something that is easy enough to do on our own! Thanks for your reply in advance! Definitely try to take in a hike or mountain bike through Rose Valley. Either hostel will provide you with a map and directions, so no guide is needed. Just make sure you bring lots of water. We’d also recommend the green tour (everyone in town will know which tour this is) which takes you to the largest / deepest underground city in the world and a number of other highlights. The tour doesn’t cost much and is great value as it includes all your entrance fees, transportation, and lunch. It would cost you the same or more to self-drive the tour. 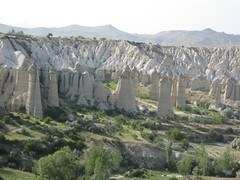 If you are looking to stay in a hostel, we stayed at Rock Valley Pension in Goreme. It was clean, offered a tasty free breakfast, and free wireless internet provided you bring your own laptop. We’ve also heard great things about Kose pension. There are other towns in the Cappadocia area that you can stay in, however we found Goreme to be ideally located, quiet, and well priced.